On October 31st the United Nations announced the birth of the seven billionth person. Many stories were published on this event, but to me the most revealing was by David Suzuki, the venerable leader of Canada’s environmental movement. As Suzuki pointed out, the human population has increased three-fold during his lifetime. Nonetheless, he refused to blame population growth for our ecological malaise. As Suzuki argues, “most environmental devastation is not directly caused by individuals or households, but by corporations driven more by profits than human needs.” According to his line of thinking, it is overconsumption by the wealthy, not the ever-increasing population, that is causing the problem. There was a time when population size was a central concern within the environmental movement. 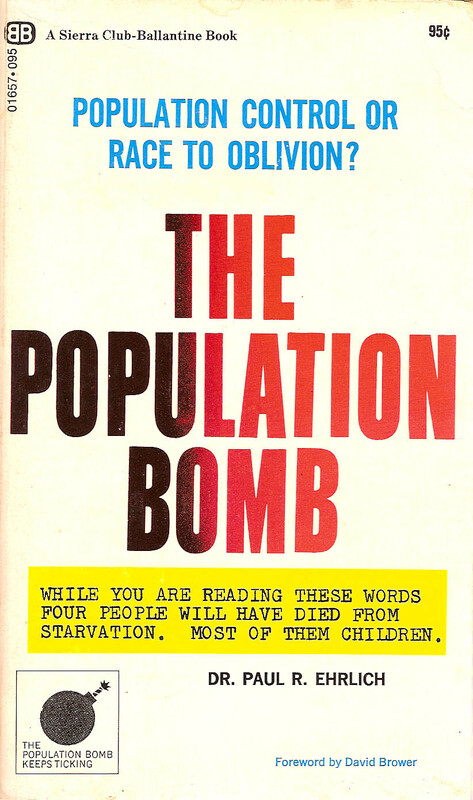 Stanford biologist Paul R. Ehrlich’s 1968 treatise, The Population Bomb, sat alongside Rachel Carson’s Silent Spring on environmentalists’ “must read” list. Full of doom and gloom, this book linked exponential growth of the human population with ecological destruction, resource exhaustion, mass starvation, and political instability. The only solution, according to Ehrlich, was to reduce the rate of population growth to zero percent. A variety of solutions were prescribed, including tax incentives to men that voluntarily underwent sterilization, luxury taxes on children’s goods, the promotion of abortion and other forms of birth control for women, and an end to foreign aid to countries that did not put a check on their population growth. 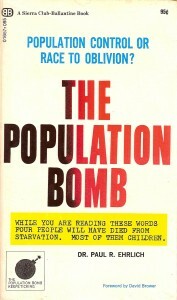 The Population Bomb sold millions of copies, Ehrlich became a media darling, and the goal of reducing the global population became standard within the American environmental movement. As Roy Beck and Leo Kolankiewicz have pointed out, support for population control among the environmental movement’s leadership in the United States “was paralleled, and bolstered, by widespread agreement among influential researchers and scholars in the natural sciences throughout the 1960s and 1970s.” By the 1990s, however, this support had subsided. Beck and Kolankiewicz note many reasons for this drop, chief among them being the fact that it proved to be politically incorrect to critique immigration, the main source of the United States’ population increase in the years following 1972. It is worth noting that while Suzuki dismissed the advocates of population control as rich white conservatives, the chief benefactors of Zero Population Growth Canada were George and Barbara Cadbury. It is true that the Cadburys were wealthy, but they were hardly conservative. Important players within the International Planned Parenthood Federation, the couple left England for Canada when George decided to work for David Lewis’ Co-operative Commonwealth Federation government in Saskatchewan. George later served as president of the New Democratic Party of Ontario. According to a survey released in July by the Association for Canadian Studies in Montreal, 54 percent of Canadians felt that the current population was “the right number of people,” while 33 percent felt it was “not big enough.” Those advocating a larger population include Robert Kaplan, the former Solicitor General of Canada, who wrote an opinion piece in the Globe and Mail calling for a Canadian population of 100 million – roughly triple its current size. Advocates of population control, meanwhile, have been assigned to the fringes of the internet, where a variety of organizations continue to operate. The dominant paradigm from forty years ago now appears to have been assigned to the dustbins of history. What were the actions taken by the government to increase the population in Canada since they have a low rate of population?